Cuba. 29 Jan 2014. © Liliana Gomez Luna. This is the type species (holotype) of the genus Oxyrrhis. Type locality: Mediterranean (Dujardin 1841: 347). Notes: Iconotype: pl. V: fig. 4? Leblond, J.D., Dodson, J. & Dahmen, J.L. (2013). Mono- and digalctosyldiacylglycerol composition of dinoflagellates, VII. 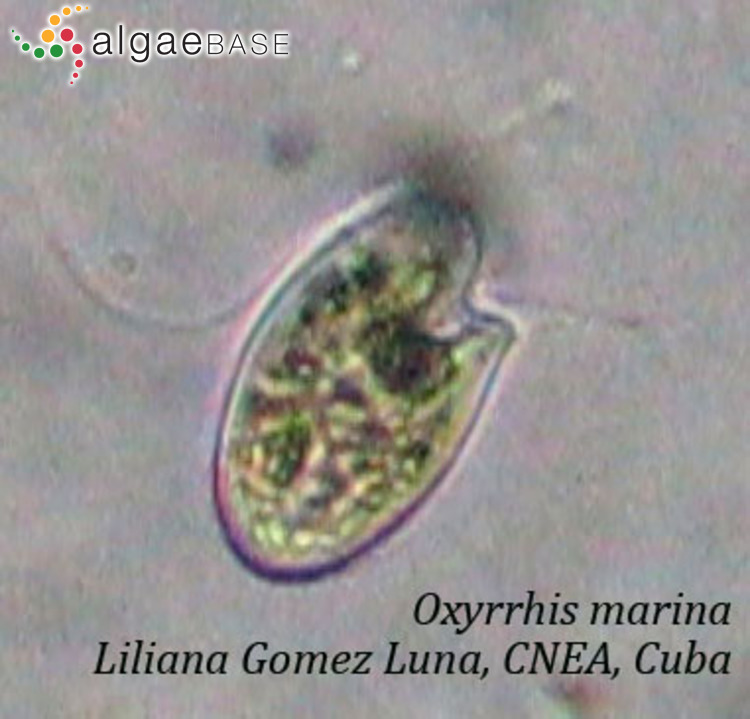 Evidence against galactolipid production and plastid presence in the heterotrophic, basal dinoflagellate, Oxyrrhis marina. 48(3): 309-317. Yoon, E.Y., Park, J., Jeong, H.J. & Rho, J.-R. (2017). Fatty acid composition and docosahexaenoic acid (DHA) content of the heterotrophic dinoflgellate Oxrrhis marina fed on dried yeast: compared with algal prey. Algae. An International Journal of Algal Research 32(1): 67-74. Accesses: This record has been accessed by users 3440 times since it was created. Clarke, K.J. & Pennick, N.C. (1972). Flagellar scales in Oxyrrhis marina Dujardin. British Phycological Journal 7: 357-360. Clarke, K.J. & Pennick, N.C. (1976). The occurrence of body scales in Oxyrrhis marina Dujardin. British Phycological Journal 11: 345-348. Dodge, J.D. & Crawford, R.M. (1971). Fine structure of the dinoflagellate Oxyrrhis marina II. The flagellar system. Protistologica 7: 399-409. Dodge, J.D. & Crawford, R.M. (1974). Fine structure of the dinoflagellate Oxyrrhis marina III - Phagotrophy. Protistologica 10: 239-244. Droop, M.R. & Pennock, J.F. (1971). Terpenoid quinones and steroids in the nutrition of Oxyrrhis marina. Journal of the Marine Biological Association of the United Kingdom 51: 455-470. Droop, M.R. (1959). A note on some physical conditions for cultivating Oxyrrhis marina. Journal of the Marine Biological Association of the United Kingdom 38: 599-604. Droop, M.R. (1959). 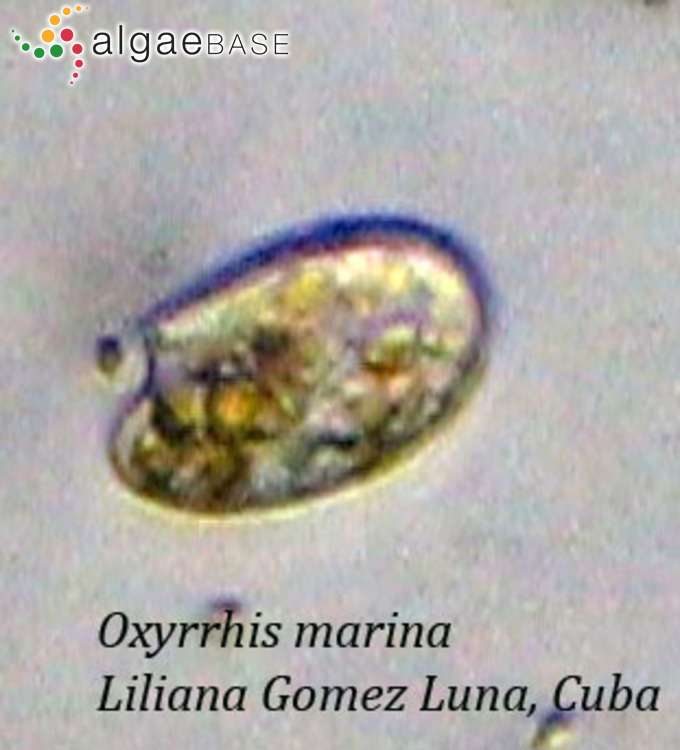 Nutrition of Oxyrrhis marina Dujardin. British Phycological Bulletin 1(7): 27-28. Droop, M.R. (1959). Water-soluble factors in the nutrition of Oxyrrhis marina. Journal of the Marine Biological Association of the United Kingdom 38: 605-620. Höhfeld, I. & Melkonian, M. (1998). Lifting the curtain? The microtubular cytoskeleton of Oxyrrhis marina (Dinophyceae) and its rearrangement during Phagocytosis. 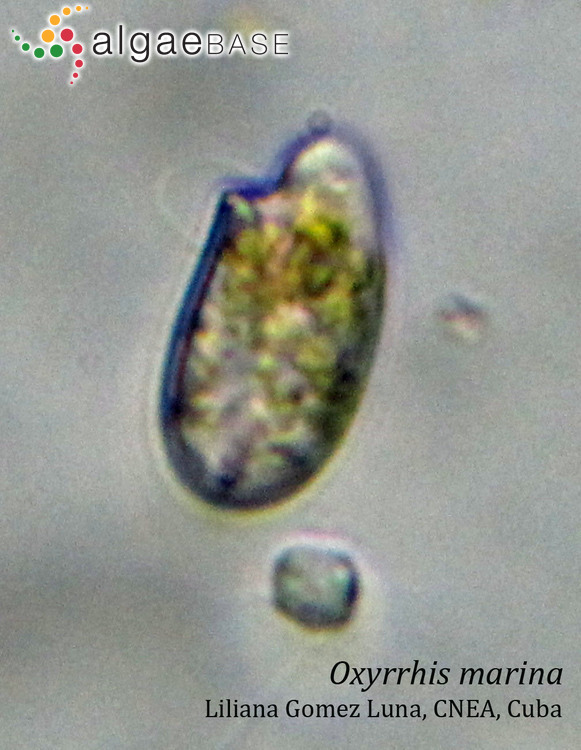 Protist 149: , 75-88. Höhfeld, I., Beech, P.L. & Melkonian, M. (1994). 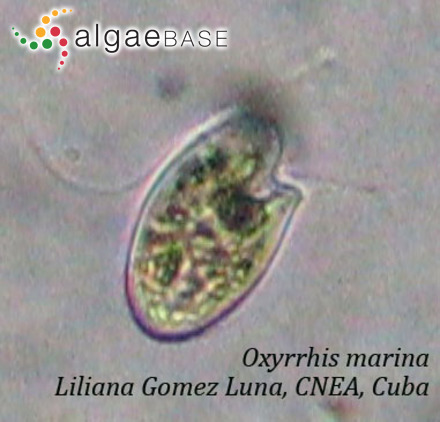 Immunolocalization of centrin in Oxyrrhis marina (Dinophyceae). Journal of Phycology 30: 474-489, 44 figs. Kristiansen, J. (1974). Rødfarvring af Horn Sø ved Lemvig forårsaget af dinoflagellaten Oxyrrhis marina. Flora Fauna 80: 65-69. Roberts, K.R. (1985). The flagellar apparatus of Oxyrrhis marina (Pyrrophyta). Journal of Phycology 21: 641-655, 42 figs. Roberts, K.R., Rusche, M.L. & Taylor, F.J.R. (1993). The cortical microtubular cytoskeleton of Oxyrrhis marina (Dinophyceae) observed with immunofluorescence and electron microscopy. Journal of Phycology 29: 642 -649, 17 figs. Triemer, R.E. (1982). 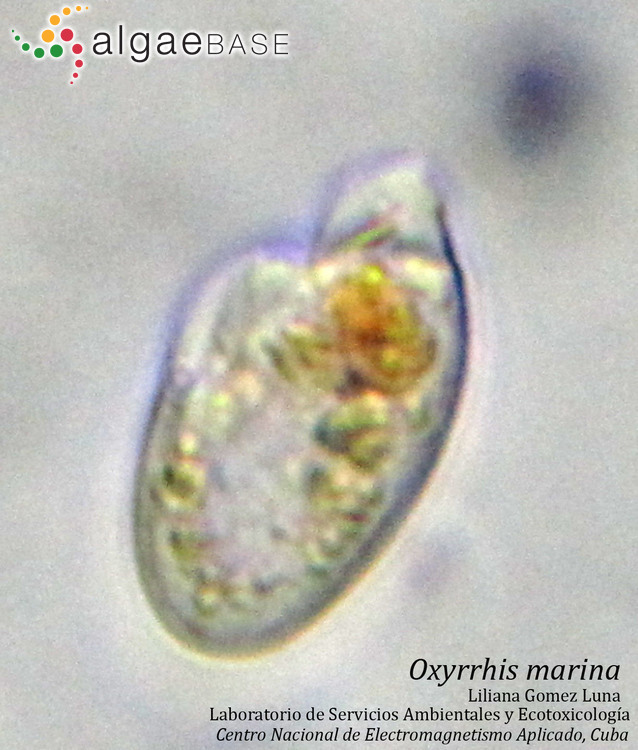 A unique mitotic variation in the marine dinoflagellate Oxyrrhis marina (Pyrrophyta). Journal of Phycology 18: 399-411, 20 figs.